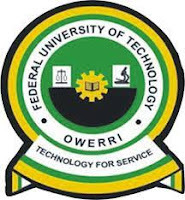 This is to inform all the newly admitted students of the Federal University of Technology, Owerri (FUTO), that the management has released the registration schedule for the 2017/2018 academic session. All newly admitted freshmen whose names are on the Merit, JUPEB (YRS 1&11), Direct Entry and Batch A Supplementary Admission Lists are required to visit the University’s website for the 2017/18 Registration Guideline. Those who have paid their fees are requested to report to the SOSC Extension Building (Upstairs) near Old SEET Roundabout, FUTO from Tuesday 9th January, to Friday 19th January, 2018 for registration as from 9.00am. Candidates are advised to follow the underlisted registration schedule strictly. FUTO Registration Schedule for Fresh Students.